SIMPSON BAY, St. Maarten (March 23, 2014) - Recognition awards for excellence keep pouring in for the Princess Juliana International Airport (SXM), the latest being the Award for Excellence for Outstanding Managerial Leadership, Strategy Development, Customer Orientation, and Strategy Implementation granted last week by JMB Communications. JMB owns the well-known website, www.everythingsxm.com. 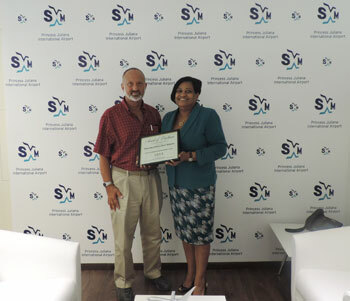 Jeff Berger, CEO of JMB Communications, surprised Regina LaBega, Managing Director of SXM Airport with the award during an interview at her office for his newsletter SXM Weekly News. “This was completely unexpected,” said LaBega, who noted that according to Berger, the award has never been granted to an airport. “We are humbled by this recognition, which gives us further encouragement to work even harder to continue to make SXM Airport a leader in Caribbean aviation, while improving the passenger experience,” she added. “We give out several awards each year, usually in February or March to businesses primarily oriented to tourists. We will present others within the next week or so. There is no preset list. Our eyes are wide open all the time looking for the best businesses,” Berger added. His website, www.everythingstmaarten.com, is the largest, most complete guide to Everything St. Maarten/St. Martin, while his newsletter, SXM Weekly News is focused on the needs of tourists with a readership that is close to 200,000.